I've got a busy few weeks ahead, so I thought it would be a good time to list all the places you can find rose among thorns goodies. Firstly, no matter where you are in the world, you can buy them from felt. If you would like international shipping prices, send me a message and I will let you know the prices for where you live. You can also purchase my mini teardrops from Sanderson China and Pottery in Waikuku. A great community market featuring local crafts, food and produce. It is held from 10am till 1pm on the grassy area next to the Rolleston Community Centre. If it's raining, it will be held indoors at the stadium. Click here for directions. Hot on the heels of Craft2.0, Felt is proud to present The Night Market, a Christmas shopping event on Thursday 3 December from 6pm till 10pm, for those who like something different. 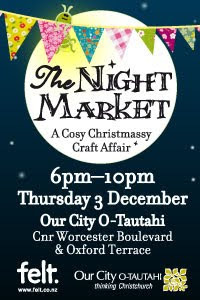 Featuring some of the best and brightest of the Christchurch craft community, The Night Market is a treasure trove of beautiful handmade products, including jewellery, accessories, candles, books and all manner of gorgeous Christmas decorations and gift ideas. Head along after work or make a night of it! Art Attack is a new Art and Craft exhibition to be held in the Thorrington School Hall on the 5th & 6th of December 2009 as a fundraiser for two Cashmere High School students. Jasmine is to attend Space Camp at Nasa, USA and Hope to Shanghai, China with Cashmere High School Music Tour. There will be a large variety of paintings sculptures and crafts for sale. Also featured are the finalists of the Art Attack Students Art Competition. There will be delicious food, music, raffles and much more. As this is an exhibition I won't be there during the day. If you are interested in participating in this event, contact Maree through the event page, or email me and I will send you the details. It's a great opportunity to sell some of your wares and help raise funds for the girls. While it's on, you could be at home creating more crafts, or outside soaking up the sunshine. It's up to you! If you come to either of the Rolleston Markets, or the Night Market, bring along your old candles for me to recycle, and receive a 10% off discount coupon for rose among thorns. If you have any old tealights, please bring them, as I have starting making recycled tealights and need some more.